Effective Onscreen Editing: New Tools for an Old Profession. 3rd edition. By Geoff Hart. Pointe-Claire, Quebec: Diaskeuasis Publishing, 2016. Printed version: 518 pages, US$33 + shipping from Lulu, ISBN 978-1-927972-04-5; PDF version: 827 pages, US$28 outside Canada, ISBN 978-1-927972-05-2; EPUB version: unpaginated and included with PDF, ISBN 978-1-927972-06-9. Are you struggling to apply techniques from your paper-based editorial training to real-life, onscreen projects? Learning to edit on the job and in need of some confidence-boosting tips? Or are you simply looking to save precious time? Hart’s guide is your answer. Now in its 3rd edition (1st and 2nd editions reviewed for SWET by Kay Vreeland), this handbook for screen-based editing presents tricks and techniques that can save countless minutes per day. Hart’s solutions focus on Word 2010 (for Windows) and Word 2011 (for Macs), though his main aim is to coach readers not on software but on editing strategies. By combining sound advice on editing basics, step-by-step guides to the technology and tips on client relations, he does just that. Appropriately, the book is fully available in onscreen form. Read it as an eBook in PDF or EPUB format. Use the online annotated screenshots, accessible via hyperlink from the eBook, as visual aids to help you follow Hart’s suggested procedures. You can even download the material as a ZIP file for offline use. A few highlights jump out. The all-important human aspect of editing is dealt with comprehensively. If your colleagues or contributors are split across several locations and time zones, ease communication headaches with Hart’s analysis of the available options for real-time collaborative editing, new in this edition. Particularly relevant to Japan-focused editors is the section on dealing with Asian grid-based layouts, fonts and other document features. A chapter on proofreading covers marking up PDFs with Adobe Acrobat. And if you’re new to freelance editing, Hart even holds your hand through the process of calculating your first rates. Whatever your onscreen editing conundrum, the book’s detailed Table of Contents makes it easy to find the relevant topic, and eBook users can jump straight there with a single click. Want to know how to get the best out of screen-based style sheets? Skip to Chapter 9 for a thorough analysis (and find a handy style sheet example on the website). Wondering (as I was) exactly what macros are and why they’re useful? Chapter 11 sheds light on these ‘simple programs’ and how they can spare you a lot of repeated actions. Put this book to the test and it will prove its value as a reference guide. In this world of screen-based interactions, traditional editing and style manuals such as CMS or Butcher’s Copy-editing only get you so far. 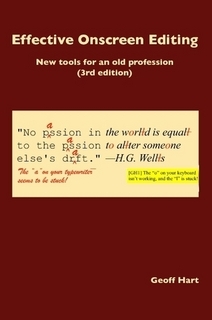 Hart’s book bridges the gap and teaches you to apply editing principles in practice, wangling the technology as you go—an essential weapon in your professional armory. Clare Midgley is an editor from the UK. After several years working in academic journal publishing in Cambridge, she moved to Hyogo prefecture in early 2015. She joined SWET not long after arriving in Japan and found contact with other members of great help in her efforts to get a foot in the door as an English-language editor.